Home / Baseball Tips / How to hit a baseball like Mike Trout by being selectively aggressive! 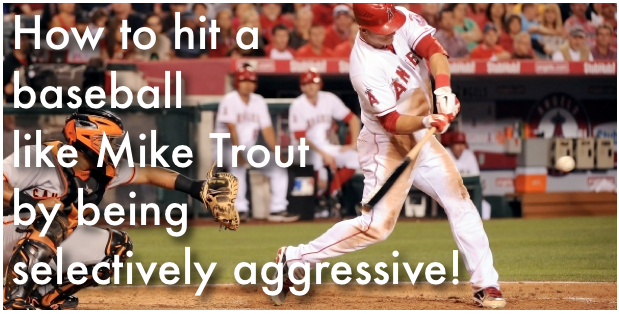 How to hit a baseball like Mike Trout by being selectively aggressive! Mike Trout had a HUUUUUGE year last year! .326 Batting Average + 30 Home-Runs in 559 At-Bats! Pretty amazing right? So how did he do it? How did he have such a successful rookie season? Did he discover some secret batting tips or hitting strategy that rocketed him into the stratosphere of some of the most impressive rookie seasons? We’ll I can tell you that it’s no secret within the big leagues. He’s doing exactly what has been taught at the highest level of baseball for a very long time. Learn how to be selectively aggressive! In this video I will be highlighting a few mental hitting tips and best practices on becoming a better hitter who is able to leverage being in a good “hitter’s count” in exactly the same way Mike Trout does. You know I love hearing your feedback! Tell how in the comment box below what you think of the videos and how I can make them better. Also, let us know in the comments box below what your approach has been during your at-bats.